The Nature Going Smart Hemp Yoga Belt combines sustainability, resistance and slip-free support for even the most challenging positions. We kept our belts simple, effective and natural: just as you like it. 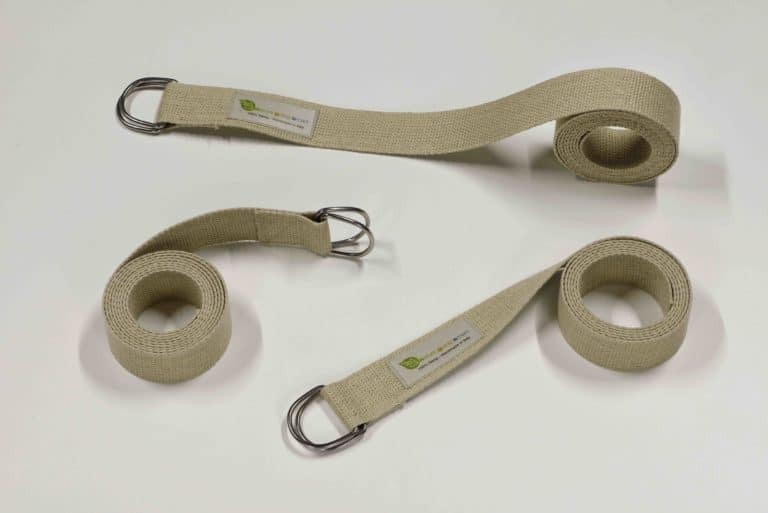 No bleaching agents have been used on this belt, enhancing the beauty of natural hemp fibre. You can now focus on your personal yoga practice & begin to explore and support your body with these nature-oriented belts. Why Nature Going Smart & hemp? Hemp fibre is extremely strong, natural and durable. Compared to cotton denim, hemp fabrics have greater tear and tensile strength on both dry & wet situations, with additional anti-bacterial properties. Today, cotton crops account for less than 2.5% of cropland worldwide, but use 16% of the world pesticides. In fact, the cotton industry is a big contributor to pesticide, plastic and fertilizer pollution, severely impacting the ecosystems and our lives. Contrary to cotton, hemp is by nature extremely resistant to insects and diseases, requiring no chemicals or pesticides for its cultivation. In addition, it grows so fast that no other plants can compete with it, making the use of herbicides pointless. Hemp grows faster than trees producing way more cellulose in less time. In fact, hemp can yield 3-8 dry tons of fibre per acre in only 4 months. This is 4 times what an average forest can yield over a period of 20 years. Finally, a huge variety of ecological products can be made out of hemp. Thanks to latest technological improvements, today there’s the know-how to substitute anything made of cotton, timber or petroleum with hemp derivates. Paper, fertilisers, animal bedding, bioplastic, ethanol, methanol, building and insulating materials, cosmetic products, food supplements, natural additives & much more can be produced from leftover waste when processing hemp for fibre. Encouraging the hemp market means choosing an alternative to deforestation & petro-chemical production, promoting a more conscious approach to limited natural resources & human life. In today’s society, each act is a vote. With your choices, you drive the direction companies will take in the next future. We hope you will enjoy our sustainable Hemp Yoga Mat Bags. Viola & Andrea, Nature Going Smart’s founders.